With cold weather approaching, many turn their thoughts to evenings by the fireplace, sipping hot cocoa, or being surrounded by family during the holidays. For others, cold weather signals something entirely different--with few prospects for warm places to stay, this is a very frightening and uncertain time of year for the thousands of individuals who find themselves without homes in the Metro Detroit area. World Homeless Day, which takes place every year on October 10, asks us to consider these individuals and try to make an impact in any way we can. Each year on World Homeless Day, Brooks Young* organizes an event in Mount Clemens to bring awareness of the issues surrounding homelessness as well as ensuring that homeless people in the area have at least one good meal that day. This year, she invited Street Medicine Detroit to join her. A group of us had the pleasure of meeting Ms. Young and talking with several people who stopped by for a meal and medical attention. 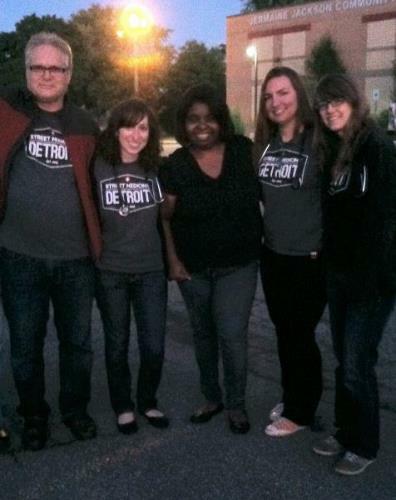 Our group in Mount Clemens on World Homeless Day 2013. From left: Dean Carpenter, RN, FNP-BC; Sarah Bommarito, Communications Director, MSII; Brooks Young; Gabriella Rubino, Director of Education and Training, MSII; and Allison Pianosi, President, MSII. Although homelessness presents on a larger scale in Detroit than in many other cities, this event reminded us that being homeless is a very real concern for individuals everywhere. While Street Medicine Detroit unfortunately cannot reach out to everyone in need, talking to Ms. Young about her efforts left us with a sense of hope. Ms. Young organizes multiple events per year and truly cares about the people she serves. For those who may go days without talking to another person, being shown this type of consideration and thoughtfulness can be a major force for positive change. We were not able to see many patients on World Homeless Day, but we appreciate the opportunity to have helped those we did encounter. We are extremely grateful for Ms. Young and the many others who notice a need within their communities and take steps to fill that need. Engaging in these efforts--however small your role may seem--can, at the very least, allow someone to regain his sense of dignity and humanity, if even for a day. *For more information about Brooks Young’s events, please visit her website at http://brooksjyoung.com/.